Flange Panel Gauge 2000PSI/BAR - August Industries Inc. Highest quality WIKA brand, liquid filled front flange mount. This style gauge has a front flange with three mounting holes in the flange for panel mounting. 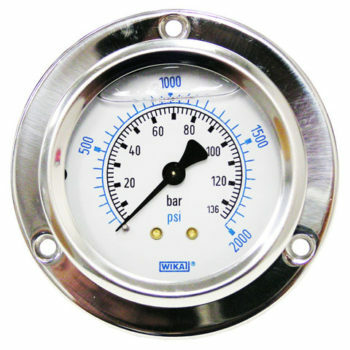 This style gauge is very popular with many European brand of compressors. Gauge has a stainless steel case and comes filled with fluid to dampen pulsations in pressures. Connection in the rear is 1/4″ NPT Male.